In a previous post, we looked at how Olympic Gold Medalist Paul Goodison starts in a really good fleet. Here's another creative example. 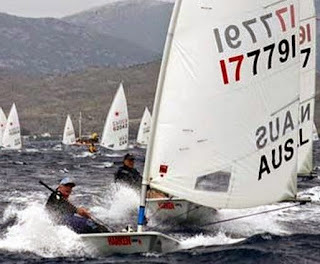 The starting line for the Grand Masters at the 2007 Worlds in Spain was really long. The pin was a yacht with a tall mast and there was a hill in the distance, so line sights were not the problem. What was the problem was the number of boats and the length of the line... it seemed impossible to get the "big picture" with the other boats, where there were holes in the line, etc. To make things more challenging, the rules stated that if you were over the line in the last 90 seconds, you had to go around the ends, which simply could not be done from most of the line. So competitors had to commit early, line up, be conservative, hope that those around would behave, and then hope for the best. Mark Bethwaite (AUS) came up with a much better solution. 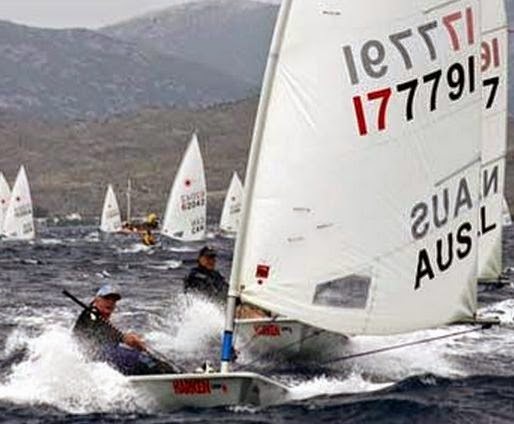 Mark has won a dozen world championships in everything from J24's and Solings to Lasers. With 3 minutes to go, he started 30 meters to windward of the committee boat and sailed parallel to the line on starboard. From there, he was able to see the big picture, where the holes were, and who he wanted to start with. From there, he would simply sail through the line and grab the position that he liked. The Laser Masters Worlds in Roses Spain in 2007 is a dim memory but my main recollection is that after meticulous training and gear preparation, my sailing bag never made it through Heathrow to Barcelona so I had to scramble for a sail, battens, tiller, control lines, other equipment and even sailing clothes just to get on the water! I am forever grateful to you, Geoff Lucas, Bruce Martinson and others for assistance. Winning that regatta after such a disastrous start was a "sweet victory" as politicians are fond of saying! You are right in your recollection of my starting - I have developed an approach to sailing which I would describe as scripted/unscripted. 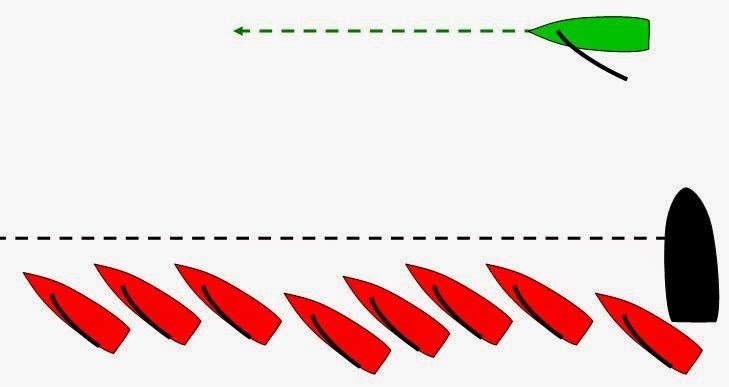 An important element of the scripted part is pre regatta training to establish fitness and fast settings with good calibration to be able to replicate them to achieve reliable speed. That then lets you get the head out of the boat to focus on the unscripted bit. Applied to the starting situation, the scripted part means getting out early, establishing port and starboard tack mean compass readings and tidal current if any. Optimising set up by "cranking up" with a less hostile competitor, plus the usual establishing transits and the favoured end of the line are essential parts of the script. I like then to relax, stretch in the boat and observe wind, waves and competitors preparations and of course any starts prior to mine. I start racing mentally at the 5 minute signal - starting the countdown, sailing flat out on port from the Committee Boat, confirming 4 minutes, sailing flat out on starboard to bring me upwind of mid line at 3 minutes. My last minute port and starboard readings will confirm or otherwise the favoured end so I then run back across the line (or outside the pin if that end favoured), gybe and approach the fleet on port to keep options open for as long as possible. 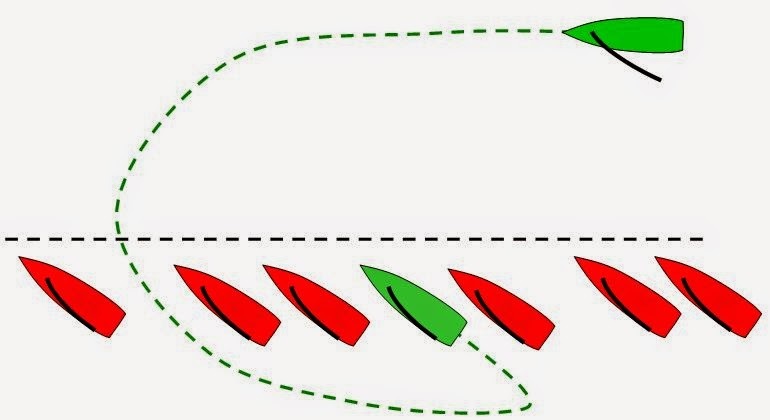 The unscripted part starts with looking for lower boat density an acceptable distance from the favoured end, tacking to starboard between 60 and 90 seconds, working through to the front stalls, defending that position against all and sundry and aiming to have room to accelerate just before the gun. Back to scripted by sailing flat out to hold the lane while remaining aware of the spatial distribution of boats on the race course. Back to unscripted again - there is no more important tack in the race than the first after the start, whether to consolidate a good start, recover from a bad one or to head towards the next heading shift. 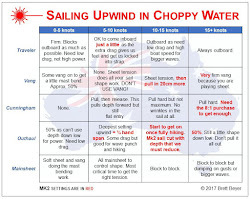 How to determine that next heading shift is a key question I have endeavoured to answer in Chapter 29.4 "Cutting the Corners" that my father Frank asked me to write for Higher Performance Sailing. Of one thing I am sure - my sailing now is less scripted than ever before as we are always dealing with dynamics - ever changing wind and spatial distribution of competitors. A script has no chance of success in this environment and even if the knowns of tide or geography favour one side or the other, how you get there and back to the next mark will always be improved by unscripted responses to real time observations of wind and competitors. 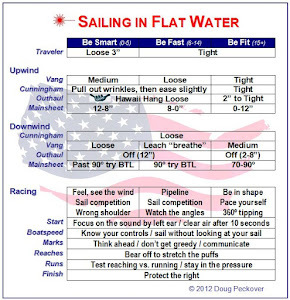 This takes me back to the statement above about how time in the boat establishes the virtuous circle of reliable speed, more time to get the head out of the boat, earlier and better analysis of the wind and competitor environment, better real time decision making and better boat positioning on the course. 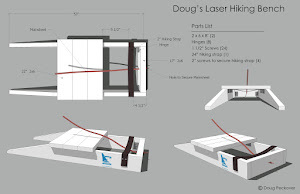 Mark is fast in all conditions and I have had the pleasure of sailing Lasers with him for 40 years now. We'll be training together the week before the Kingston Master Worlds. For those travelling by air, a word of advice: like Mark, I too have arrived at a Worlds with no sailing gear. Plan ahead and put your sailing essentials in your carry-on luggage. Paul Goodison has won Olympic Gold and Mark has won worlds in multiple classes. The next starting expert we'll look at has done both. Great stuff. I went to watch the Volvo Ocean Race boats do some pro-am races in Newport today and, to my great surprise, two of the boats did try a variation of the Bethwaite dip start. And that's good advice about precautions to avoid arriving at a Worlds with no sailing gear. The airline lost my luggage back in the late 90s when I was flying to the Sunfish Worlds in Cartagena, Colombia. And the even worse thing was that that airline only flew from New York to Cartagena twice a week so I had to wait 3 or 4 days for my bag to show up. Thankfully I had packed the sailing essentials in my carry-on. Amen. Another variation of this travelling advice comes from my recent trip to the Oman worlds. There were mechanical problems and my Turkish Airlines flight left the US late, and I missed my connecting flight in Istanbul. So the good news is that I got to spend a fabulous day in a city that was on my bucket list, but the bad news is that I did not have a change of clothes or any of the necessities you'd want on a one day visit. Lesson learned. Not that it matters much, but Mark is sailing on starboard tack above the line.